FreeMind is a free, open-source mind-mapping software written in Java for creating structured diagrams. It’s an easy-to-use, cross-platform tool licensed under the GNU General Public License Version 2 and is famed for giving users the freedom to use Mac OS, Windows, and Linux operating systems (OS) within the Java Runtime Environment. The program provides quick keyboard shortcuts to make it easy for users to visualize ideas, concepts, projects, internet search, brainstorming, or any other functions that can leverage the benefits of structured view. FreeMind is built for users in different industries including business, education, government, and more who can participate in idea generation, project tracking, task management-based mind maps, and presentation making. It’s a simple yet robust tool that encompasses an impressive set of features including color formatting options, file & web hyperlinks for nodes, built-in icons, find a facility, folding branches, and graphical links connecting nodes. FreeMind is a reliable, high productivity mind-mapping tool that is programmed in Java for unprecedented cross-platform portability. At its most basic, the solution delivers the flexibility you require to organize ideas on a page as they link to each other and the main picture. It is a premier mind-mapping platform that lets you edit XML/HTML docs, directory trees, and mind maps with one-click “fold & unfold” and “follow link” operations for quick navigations. The software’s basics are simple, but the tool is surprisingly powerful in entirety, especially when you consider its finer details. The smart drag and drop feature allows you to copy nodes or styles of nodes, drag and drop multiple selected nodes, or drop texts or list of files from an external source. On the other hand, the smart copy and paste function facilitates the pasting of links from HTML, formatting of the pasted content, and pasting of the selected list of files. Additionally, FreeMind offers support for hyperlinks which permit you to link documents and websites to your mind maps. It provides a project workplace that includes links to vital files, the source of information, executables, and data. This, coupled with the intuitive drag-and-drop functionality as well as the versioning capability, hasten note taking and help you visualize processes and projects with ease. Better still, FreeMind allows you to export your landscape of thoughts in multiple formats including PDF, HTML, and JPEG. If you are interested in FreeMind it might also be sensible to investigate other subcategories of Best Mind Mapping Software listed in our database of B2B software reviews. Organizations have unique needs and requirements and no software application can be perfect in such a condition. It is useless to try to find an ideal off-the-shelf software product that fulfills all your business needs. The wise thing to do would be to adapt the application for your specific wants, worker skill levels, finances, and other factors. For these reasons, do not rush and pay for well-publicized popular solutions. Though these may be widely used, they may not be the perfect fit for your specific wants. Do your homework, look into each short-listed platform in detail, read a few FreeMind reviews, contact the seller for clarifications, and finally choose the app that presents what you want. How Much Does FreeMind Cost? 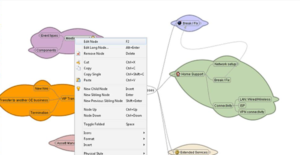 FreeMind is a free mind mapping software, there are no enterprise pricing plans. We realize that when you make a decision to buy Mind Mapping Software it’s important not only to see how experts evaluate it in their reviews, but also to find out if the real people and companies that buy it are actually satisfied with the product. That’s why we’ve created our behavior-based Customer Satisfaction Algorithm™ that gathers customer reviews, comments and FreeMind reviews across a wide range of social media sites. The data is then presented in an easy to digest form showing how many people had positive and negative experience with FreeMind. With that information at hand you should be equipped to make an informed buying decision that you won’t regret. What are FreeMind pricing details? What integrations are available for FreeMind?